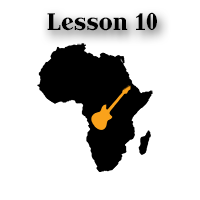 Here’s a lesson on the soukous guitar of Africa, with downloadable TAB below, in pdf, Guitar Pro and PowerTab file formats. If you are not familiar with the African soukous music, it’s basically a Congolese rumba. The Cuban dance music got really popular in both the Belgian and French Congo in the 1940s. That has led to African people covering the tunes then creating their own music, written in this peculiar style. The name of the genre, “soukous” comes from the French word “secousse” which means “shake”. When it comes to the guitar part of soukous, it’s usually something both melodic and rhythmic at the same time, with a rather repetitive and catchy nature. It’s usually not a solo style. Fast tempos, single lines, double stops, arpeggios are the major part of the genre. Short staccato strums can also appear here and there. Our example is a single melody line ending with a double stop, played fingerstyle, of course. Another signature characteristic of the guitar patterns in soukous is the relatively high pitch. Most of this tune takes place over the 12th fret on the fretboard, too. The usual advice of a slow, accurate practice for a fast performance rings true here as well. 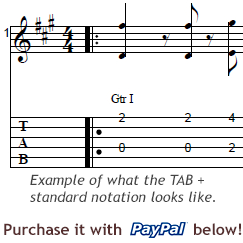 Check the tablature for the correct notes you need to play. Note that most of the notes are picked individually, without legato slides or hammer-ons/pull-offs. Doing so enhances the quick, fresh, upbeat nature of the soukous style. It also means though that you need to pay more attention to what the picking fingers are supposed to do. I suggest you to not be impatient and rush through the piece. Internalizing this focused picking technique can become a useful part of your technical skills. Also, using multiple fingers instead of a single pick can make your playing more effective. That leads to a lower chance of tension build-up and cramping.